Vegan SunButter Buckeyes. 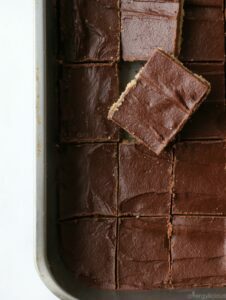 This snack is high in protein and made with SunButter, protein powder, a touch of maple syrup and dipped in vegan chocolate! Some of the most popular recipes on Allergylicious involve the combination of SunButter and Chocolate: Chocolate SunButter Bars , SunButter Protein Cups, Easy Vegan Gluten-free Brownies (+ video) , Chocolate Sunbutter Surprise Cupcakes and now these SunButter Buckeyes. Did you know that Buckeyes are the unofficial dessert of Ohio…named after the nut from a buckeye tree? 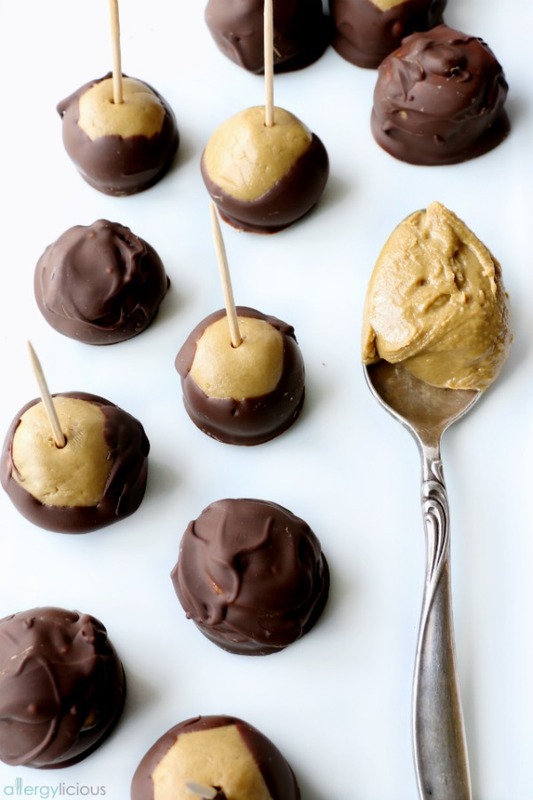 Buckeyes (the dessert) are traditionally made from a peanut butter confection, partially dipped in chocolate while leaving a circle of peanut butter visible to so that it resembles the actual nut itself. But did you see the “red flag there? It’s made from PB and having a son with a peanut & tree nut allergy means we would have to either avoid this dessert or re-create it. I choose to re-create it. In addition to it’s delightful taste, SunButter® is a both a healthy and allergy-friendly choice. It’s natural and delicious sunflower butter made from roasted US grown sunflower seeds and has 7g of protein per serving with less saturated fat than other nut butters. SunButter® also is loaded with vitamins and minerals such as magnesium, Vitamin E, zinc and iron, making it just as nutritious at is it delicious. Plus, it’s vegan, gluten-free and free from the top 8 allergens. I’d say this is a WIN WIN! Yes, I’m calling this a healthy dessert! These SunButter buckeyes require NO processed sugar (take that powdered sugar) & I added protein powder which makes these little bites a perfect afternoon snack. It also makes me feel less guilty for eating a little chocolate. 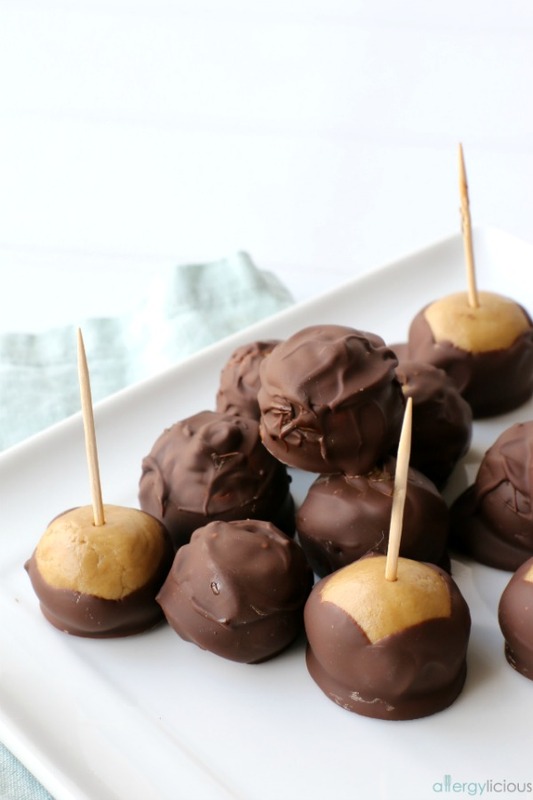 You’ll be surprised at how easy it is to make SunButter buckeyes. The center is made by simply mixing together SunButter, vanilla, protein and maple syrup until smooth. Then roll into 1″ balls, and press a toothpick into the top of each ball (to be used later as the handle for dipping) and chill in freezer until firm. Now comes the best part….adding the chocolate. Hold onto the toothpick and dip frozen balls in melted chocolate. Be sure to leave a small portion of SunButter showing at the top to make them look like Buckeyes. Put back on the cookie sheet and refrigerate or freeze until serving. 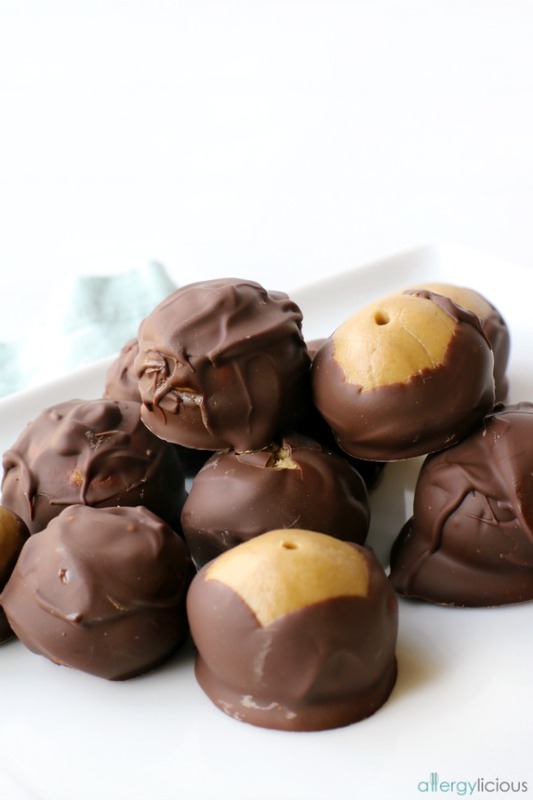 The results are incredible and these SunButter buckeyes will be a staple in your home for years! Protein packed, gluten free, allergy-friendly and vegan SunButter Buckeyes. Add SunButter, vanilla extract, protein powder, and maple syrup, to a big speed blender. Puree until all ingredients are combined into a thick “dough”. Roll the dough into 1” balls and place on a parchment lined baking sheet. Freeze until solid (30 minutes). While balls are freezing, melt chocolate and coconut oil using a double boiler or in the microwave. Just watch it closely to make sure it doesn’t burn! 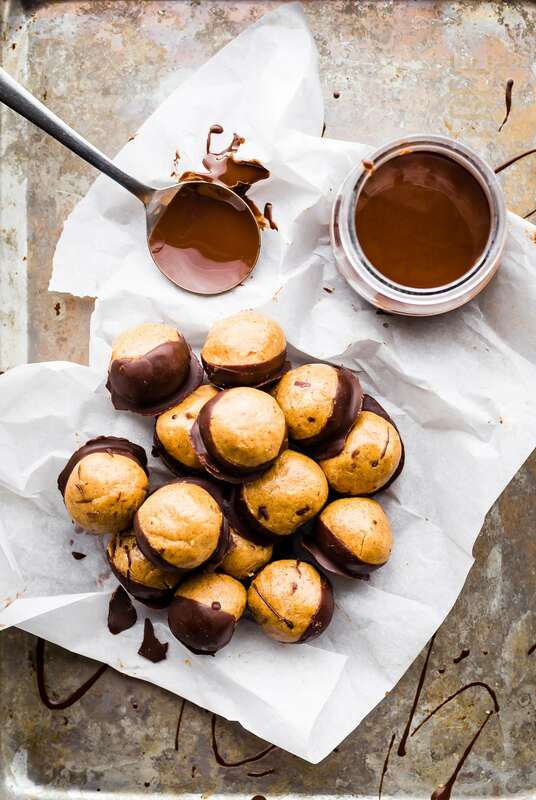 Once the balls are frozen, use a toothpick to dip each ball halfway into the melted chocolate, then place back on the parchment lined baking sheet. Freeze for another 10-15 minutes, or until chocolate has hardened. Eat immediately or keep refrigerated until ready to serve! 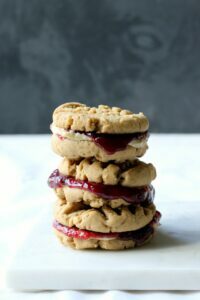 A HUGE thanks to SunButter® for partnering with me to share this recipe as continue to celebrate Allergy Awareness Month. 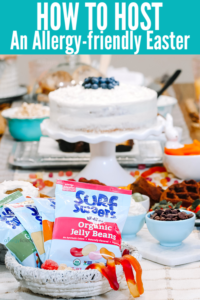 My family & I just LOVE this company and their commitment to providing safe foods for those with food allergies or restrictions. All of their products are certified Top 8 Free and available online at www.sunbutter.com or Amazon as well as most local grocery stores. 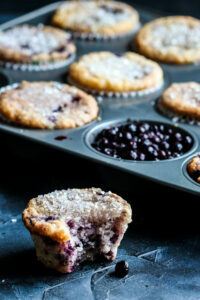 If you give any of these recipes a try, let me know by leaving a comment and rating the recipe! It’s super helpful for us. And while you’re at it, take a picture and tag it #allergylicious on Instagram so we can see! We love seeing what you come up with. What a great and easy treat! I love buckeyes. Great combo of ingredients! Thanks Kelly….This combo is delish! I have never even heard of a buckeye (dessert or nut!!). I just got an education! I’m constantly learning new things, especially when it comes to baking and whats popular in other parts of the states or country. 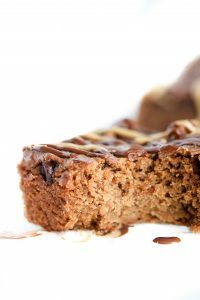 Love how you added protein powder to this dessert to give it an extra boost. I am allergic to sunflower seeds, but have recently been approved to start adding almonds to my diet (slowly), which means I may be able to make a variation of this with sun butter someday soon! That’s great on being able to eat a few almonds. I saw your post on IG and was thrilled for you. 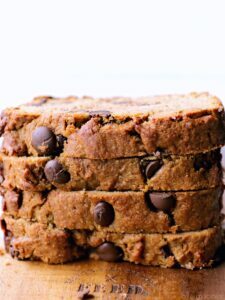 Maybe when you work up to more almonds, you can try this recipe with almond butter…at least until you can start eating sunflower seeds. Buckeyes probably aren’t a thing in England, but they should be :). And yes, they do disappear rather quickly! I keep mine in a sealed container just so they aren’t as easy to grab. what an awesome idea to use sunflowers. Thanks Jasmin! We love sunflower here. I’m all about a chocolate treat! Yum! I actually didn’t know what a buckeye was until a few years ago, but now I absolutely love them. These look heavenly. I didn’t know its relevance as well until I was a little older and researched it. They look exactly the same though…so hard to tell them apart. I’m drooling as I’m looking at my screen over here. Wish i had a stack of these now. Which brand of vanilla protein powder do you recommend? Hey Margaret, I use Arbonne for my protein powder since its vegan and GF (plus it doesn’t have that chalky taste that a lot of other proteins have). BUT OWYN is another great one if your looking for Top 8 free. Thanks Jenna…we do everything dairy free over here, so check it out anytime you’re look for a DF treat. 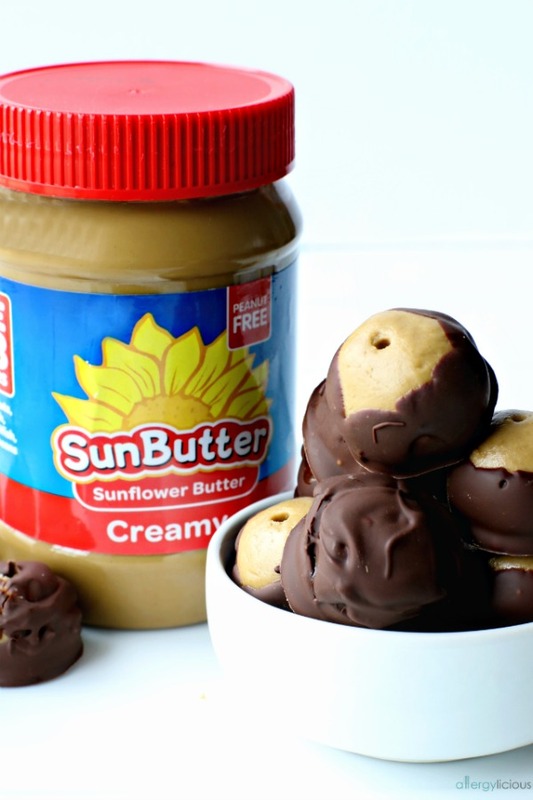 ah – I LOVE Buckeyes, I definitely need to try your sunbutter version! I hope you do Kristina! So so good. I love buckeyes! Brilliant idea to add protein powder to the mix Nicole. I often find that they can be a touch too sweet – that’s a great ingredient for balancing it out. Thanks Alisa, the protein does balance it out nicely and knowing that it’s a little healthier, is a plus! I have a confession to make: I’ve never tried SunButter before! But this certainly is incentive to do so! Yummy!! Hey Kristen…..that’s ok, I still love ya 🙂 But its a delicious, nut-free option and works perfectly in recipes…worth trying for sure. I’ve never had a Buckeye, but I’ve heard of them before! Yours look delicious and I love that you were able to make them nut-free. Such a great celebratory food or snack too! Mmm, what a lovely summer snack! I LOVE Sunbutter! It’s so sweet and creamy. And, of course, you can’t go wrong with adding chocolate. These will be a great snack all summer long! Interesting recipe. It’s looking so yummy that my son will really enjoy eating it. I would like to make it for my sons birthday bash for his friends. Keep sharing such delicious recipes. Thanks so much. My kids love this recipe…it’ll be a great choice for your son’s birthday celebration.